People of all ages love to hear stories; they entertain us, but they also teach us about the world. Joan often speaks on nutrition, and loves how, when she says, “Let me tell you a story,” the audience sets down their smart phones and reading materials, looks intently up at her and listens in rapt attention. Storytelling is not only fun but also is how the human brain best learns new concepts and internalizes information that can change one’s perspective and alter behavior. We are all immersed in ‘data-smog’ today. Scientific findings and statistics are churned out at an ever-quickening pace. Recent estimates state that the entire body of scientific knowledge has doubled just since the year 2000. It has become unmanageable to keep up with all the science on health, nutrition, fitness and wellness. So many people just throw up their hands in frustration, not knowing what to believe, while continuing to follow lifestyles and diets that are often toxic. Yet knowledge is power; you and your loved ones need this information if you are to thrive in this 21st century environment that is so foreign to our genetic identity. We hope that these stories will inspire you to take advantage of the marvels of modern science, while at the same time remaining true to the diet and exercise patterns that bestowed strength and well-being upon our ancient ancestors while they were thriving in their wild, natural environment. Our driving passion is YOU. Your health, happiness and longevity are deeply important to us: we hope you enjoy our stories, and that this book revolutionizes your life. I'm so happy to have come across this book. 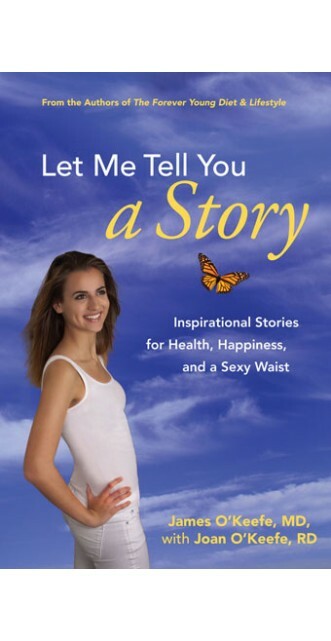 I don't know why it took so long for a diet book to be written in this down-to-earth, story-based approach. I loved it!